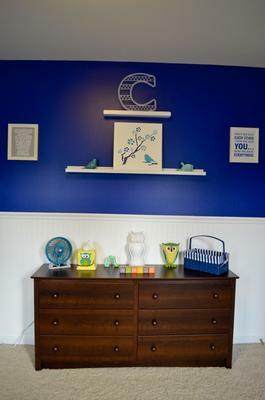 A navy blue owl nursery theme for a baby boy. My husband and I have been working on Colton's navy blue owl nursery theme for the past 6 months and now it is finally finished!! Our baby boy is due on Sunday and we are so anxious to meet him and introduce him to his new room. 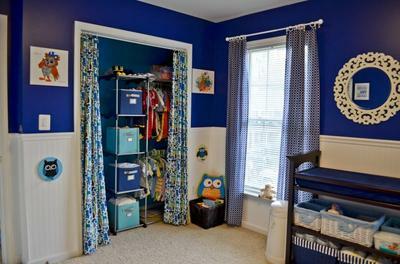 This room started out as a "store all our crap" space that we transformed into my dream owl nursery theme. I love owls and we wanted to do a white beadboard chair rail with navy blue paint on the top. It turned out even better than we could have dreamed! I wanted to incorporate my love for owls into the design to create a modern yet traditional room for Colton and made the curtains and the crib skirt using hem tape and an iron myself! I also made the paper mobile myself using colors that matched the rest of the baby nursery colors. From start to finish, we have been working decorating the nurseryfor 6 months. We took our time and really researched products to get good deals on them and kept our eye out at every store we went to for accessories. I would say it was easy but that's because we loved every minute of it. It definitely wasn't a simple task but it really helped me look forward to the arrival of our new family member. My favorite part was having a project to share with my husband that we both enjoyed so much. 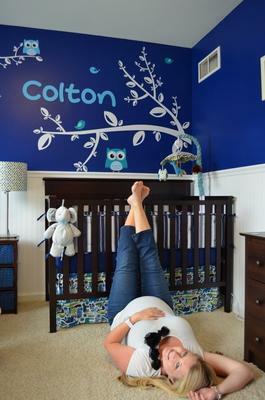 I hope that you enjoyed your visit to Colton's navy blue owl nursery theme and that you will vote for our baby boy nursery pictures to win the contest! You are also invited to visit us at our blog, Baby Adair. 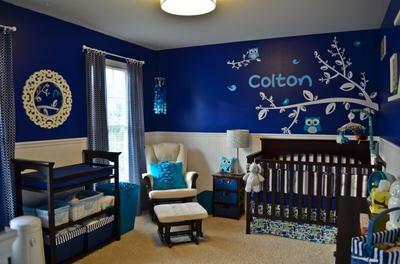 I am really impressed with Colton's nursery! Nursery Theme. I just became a father and love the color combination that you used. Like the other posters, I would like to know the name and brand of the blue wall paint color that you used if you could please post it. Thanks! The room is AMAZING! I LOVE that blue color what is it called? and where can i get it? You are a very talented person to put all of this together. It is just wonderful and I know the baby will enjoy it. Is this painted on or is it a decal, if so where did you get it. I love it. Love the name you picked for your little guy and his room is beautiful! So are you! Great maternity pic. Great work! Love this room.